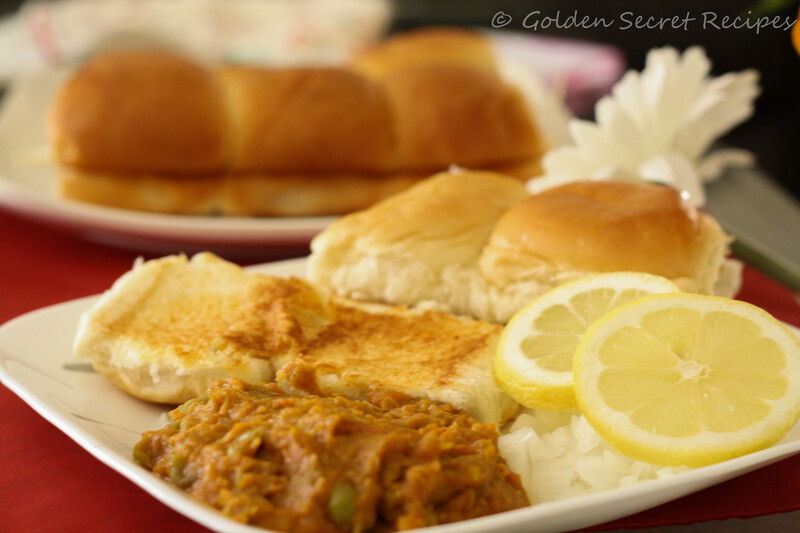 Pav Bhaji is again one of the most popular street foods in India. If you are hungry at tea time and you need something filling and yet not a deep fried oily snack, Pav bhaji would be the best choice. Every place again has its version of this mouth watering dish. I used to love the Pav bhaji that we used to get in A2B in Bangalore. One day my friend got Pav Bhaji for lunch at work. That is when I realized that this is not something that you could only buy from street stalls but you could ALSO make it at home 😉 Since this was never made before at my home, and given the fact that I knew nothing about cooking, I thought of taking a cooking lesson from this friend of mine on ‘How to make Pav Bhaji’ 🙂 I remember the enthusiasm both of us had and we were looking forward to that cooking session. All I recollect now though is that I had some delicious mouth watering pav bhaji made by my friend and I wasn’t of much help to her!!! After several tries, I have now come up with the perfect recipe of Pav Bhaji that I stick to these days. It is as simple as it could be. Green bell pepper – 1/2 nos. You could also make the pav bhaji masala yourself. Below is the ingredients if you are not using any store bought masala. 1. Boil all the vegetables(potato, green bell pepper, green peas, cauliflower) in a cooker adding little salt. Mash them and keep aside for using later. 2. Heat butter in a pan and put finely chopped onion, ginger garlic paste, chopped green chilli and little salt to it. Saute till the onion turns light pink. 3. Add red chilli powder, turmeric powder and pava bhaji masala and fry till the masalas cook(about 2 mins). 4. Add finely chopped tomato and saute till the tomato is cooked through and the mixture becomes like a paste. 5. Now add the mashed vegetables and mix well. You can add little water to adjust the consistency but the bhaji shouldn’t be too watery. It should a thick paste. 7. on a tava/pan, heat butter. You could add little pav bhaji masala to the butter and toast the pav/bun lightly (The pav/bun should be cut into halves before toasting). 8. While serving, squeeze little lime into the bhaji/gravy and top it will some finely chopped onion. 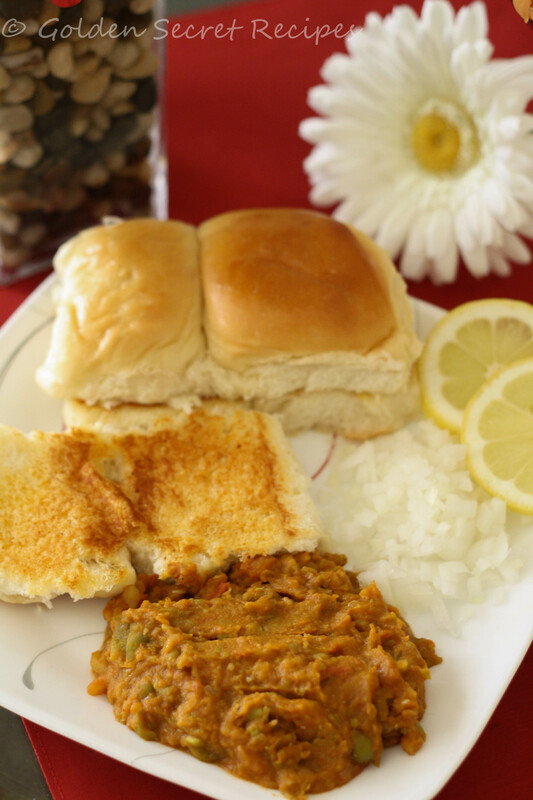 This entry was posted in Fast food 'N' Street bites, Specialities-Veggie and tagged bombay pav bhaji recipe, bombay style pav bhaji, chat masala, easy pav bhaji recipe, green peas, mashed vegetables, pav bhaji, potato, street food, street food type pava bhaji, tasty pav bhaji recipe, vegetables. Bookmark the permalink.